Lost your car keys? Get your dog to find them for you! You’ve sorted the lunch boxes, the kids are ready, the dog’s had a game, the breakfast table is sort of cleared. You’re rushing to get out of the house - and you’ve lost the car keys. Again. Instead of panicking and pulling the house apart, book by book, toy by toy, sock by sock, cursing the dog for being under your feet, why not employ said dog to help you? So in this family of equal opportunities, let’s allow our dog to contribute her own special skills to solve the problem. She could find those keys for you in moments. There’s a trick here, of course. It’s not going to work if you yell at your dog in the midst of your rush and panic. You have to teach her first! But it may surprise you how quickly she can learn to help you in this way. 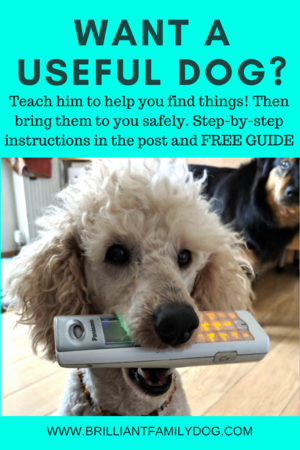 Get your free guide to teach your dog a retrieve! You’ll also need some sensationally good treats - tiny cubes of cheese or hot dog usually hit the spot. Now you can play a game with your dog with this new toy. Keep the sessions very short - maybe one or at most two minutes - and FUN! 1. Start by producing the key fob and holding it out to her - not in her face, just out in front of you. The second she so much as glances at it, say YES with delight (this is a game, remember!) and give her a small yummy treat. Put the toy behind your back again. 2. Repeat this peek-a-boo game until your dog is very keen to engage with this new toy and get her reward every single time it appears in view. By now you should have bright eyes and a swishing tail. 3. Hold the toy out to her. She’ll look at it and expect her treat. WAIT for just a moment, maybe waggle the toy a little, till she touches it with her nose. YES! Reward! If she bats it with her paw instead, ignore that and hold it much higher up. 4. After a couple of nose touches, WAIT for her to put her teeth on the toy. Maybe she’ll just give it a lick, or just maybe she’ll open her mouth a little. She may worry that she’s not allowed to touch it, so encourage her wildly and make your YES joyful with a particularly scrummy treat. End of first session. Have a game with her with one of her own toys, and put yours safely away. Next session, you can start again showing her the toy and rewarding her. Very quickly you can move the game forward to where you left off last time, with your dog touching the toy with some part of her mouth. 5. Using the same method, keep saying YES! and giving a tasty treat every time she touches the toy with her mouth. You can gradually encourage her to take the toy in her mouth, with you still holding on to it. End of second session. 6. You’re going to advance this game, making it ever so slightly harder and ever so slightly more like a full retrieve every two or three treats. In other words, take it slowly! 7. You can start to let go of the toy, let her hold it a moment, then take it back - “Thank you!” It doesn't matter if she drops it. Graduate to holding the toy nearer to the floor for her to take; holding it on your knee, dropping it by your shoe. Fast forward: within a few sessions you’ll have a dog who gets excited at the sight of your fluffy, scented, key-fob, and who will pick it up when you drop it on the floor and smartly give it back to you to swap for her treat. Work very quickly and she won’t even think of chomping on it. 8. Start tossing the toy further away always rewarding her instantly for giving it back to you. Now you can add your words: “Where are my keys?” every time you toss it. Always put the toy away again after each session. 9. Finally, play hunt-the-toy games. Let her watch you push it slightly under the corner of a rug, then send her for it - “Where are my keys?” Hide it under a cushion on the sofa and send her for it. Find new places to hide it, always making sure she has success and brings it straight back to you to swap for her treat. Keep this really simple - we only want success! We’re not testing our dog, guys. 10. Attach your keys to the fluffy fob. Now you can show her the toy and avert her eyes or leave her in a different room while you go and hide the toy in one of the places she’s found it before. Keep it easy! She’ll search all the old places till she finds it. Keep playing this game fairly regularly - don’t wait till you’re in full panic! You know the old saying, “Use it or lose it!” When you need her to find your keys you want this exciting game to be fresh in her mind. I frequently drop things on the floor (on purpose) and ask the nearest dog to “pick that up for me”. They love the opportunity to earn yet another reward! Not only will your dog quickly learn this game of finding your keys without crunching them in her teeth - not good for electronic car keys! - but you’ll be amazed how enjoyable it is teaching her. You’ll be watching the wheels go round in her head while she works out the new problem every time you move the goalposts. You’ll develop a new respect for your dog’s abilities. And she’ll love being a useful member of the family. Now … what other things could your dog help you with?